Have you seen the Fife & Drum Corps perform? I was surprised when I learned yesterday that Walt Disney World has announced plans to remove the popular shows Mo’Rockin’, Off Kilter, the World Showcase Players, and my favorite, Spirit of America Fife and Drum Corps effective the end of September. From a personal opinion, I can see the closing of some of these performance groups, but the ones that I truly feel like should not have been closed are Off Kilter and the Fife & Drum Corps. Part of me worries that they are doing this not so much for a specific reason, but rather because they feel like they need to do so in order that those people that only visit Disney once or twice will see something shiny and new instead of something that has been around for a while. For me, and others like me that really enjoy Disney and go multiple times, the biggest draw for me is the chance to take my wife and child to the Disney I know and love from my childhood. It’s not so much about riding Seven Dwarfs Mine Train — despite how incredibly cool that attraction is. For me, it’s about walking with Cindy and Sophie, seeing a show or enjoy a ride, and remembering something from a prior visit that the attraction, show, parade, etc. triggered. The best part of the Disney Magic for me is how we can be transported back in time to when we saw something for the first time. The Fife & Drum Corps performing inside the Liberty Inn restaurant! I remember that we were at World Showcase, and all of a sudden it started raining. Since it was nearly lunchtime, and we were near the American Adventure Pavilion, we decided to eat lunch at the Liberty Inn counter service restaurant. This restaurant is great because it serves good food and has a lot of seating to get in out of the elements. 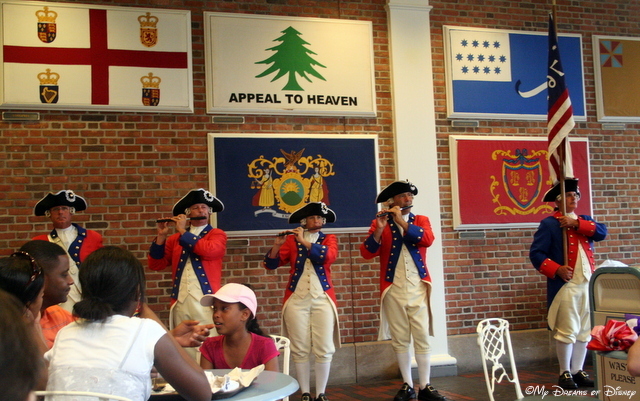 Anyway, we were inside, eating our lunch, when all of a sudden the Spirit of America Fife & Drum Corps marched in, took up their positions, and started playing for us. It was a moment where we just happened to be there, nothing was listed on the Times Guide, and Walt Disney World turned the Disney Magic up for us because of the rain (or so it seemed)! 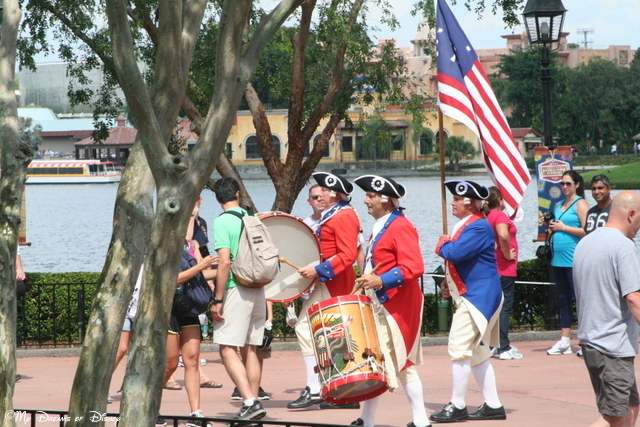 I’ve got other stories for the other World Showcase Entertainments that are closing, but to me, the one that bites deep is the closing of the Spirit of America Fife & Drum Corps. What do you think about this news? Please let me know in the comments, or on our Google+ page, or our Facebook page, or shoot me a tweet — I’d love to know your thoughts! Thanks for stopping by, and everyone, go out and make it a great Disney Day! Do you stop and wait for the Fife & Drum Corps to perform?